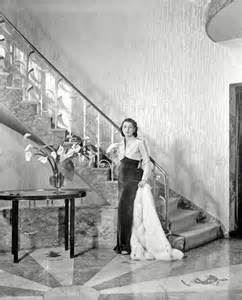 As one of Washington’s premier hostesses during the 1950s and 1960s, Gwendolyn Cafritz gave dozens of parties every year in her white brick mansion on a seven-acre hilltop overlooking Washington. “Vice Presidents, Cabinet members, Ambassadors, movie stars, Supreme Court Justices and heads of state played happily there over four administrations,” according to the New York Times. You have the chance to visit the scene of those Cafritz soirees when you attend the “Mardi Gras in September” gala being organized by the Foggy Bottom West End Village. The three-hour event, which begins at 7 p.m., will be Saturday, September 12, at 2301 Foxhall Road NW. Tickets for the gala go on sale in July here on the FBWE Village website. 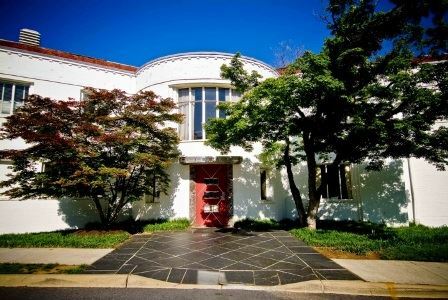 The Cafritz 57-room Art Moderne mansion and grounds today house The Field School and its large meeting room for special events like our Mardi Gras gala. The old mansion itself won’t be open to gala guests but you will be able to visit the outside terrace, which has a stunning view of the Washington Monument, and to peer from the terrace into a mansion room, which has its original wall-size murals of women in various stages of dress. A four-page account in Life magazine once depicted her favorite summer soiree, which was attended by “one or two hundred guests, in evening dress, gathered for mint juleps and steaks on the barbecue in her backyard.” During those years, the Cafritz home included a basement nightclub with an illuminated dance floor and an Olympic-size swimming pool. Gwendolyn Detre de Surany was born in Budapest and moved to Washington in the 1920s with her family. She met Lithuanian-born Morris Cafritz in 1928 and they married the next year. After owning several businesses including bowling alleys, he went into real estate and started developing the Northwest Washington neighborhood of Petworth, where he sold houses for $8,950 or financed them for $1 down and $75 a month. Later he built office buildings along K Street NW. In 1948, he founded the Morris and Gwendolyn Cafritz Foundation. In 1949, the couple built their mansion at 2301 Foxhall Road NW. He died in 1964 and she died in 1988 at her home. The Field School, founded in 1972 by a teacher named Elizabeth C. Ely, moved into the Cafritz mansion and grounds in 2002. The school name comes from Ely’s vision of a place where a classic curriculum encompassing organized "fields" of knowledge could be taught in a small, informal environment that stressed dialogue, analytic thinking, and larger lessons of how young people could grow to become generous, responsible, self-knowing adults. The school teaches sixth through 12th grade, with about 380 students attending. The campus now covers 10.5 acres and features a gymnasium on one side of the old Cafritz home and the Elizabeth Meeting House on the other side. The Elizabeth Meeting House, named after the founder, will be transformed into a jazz club for our Mardi Gras gala on September 12. There will be live music and a dance floor, in addition to New Orleans-style hors d’oeuvres, games, auctions for gift certificates and vacations and tickets for celebrity salons. You don’t want to miss this chance to visit The Field School, the site of so many historic social events.